While fossil plant remains are nowhere as abundant as the remains of fossil vertebrates, or invertebrates in Florida, they are nonetheless, an important part of Florida’s fossil record. In fact, the fossil sea grasses found in the limestones of the Middle Eocene Avon Park Formation of south-central Florida are among the oldest fossils known from Florida. Other leaf impressions are seen in Miocene, Pliocene, and Pleistocene clays. Petrified woods, represented by several different trees, are sometimes found in the same layers as vertebrate fossils. A good example is the vertebrate rich Bone Valley Formation of Polk, Hillsborough, and Hardee Counties which has produced sections of petrified tree trunks weighing hundreds of pounds. At the microscopic level, Florida sediments are rich in fossil pollen, diatoms, and phytoliths. Although these fossils are too small to be seen with the unaided eye, their unique beauty and scientific importance as environmental indicators make these fossils an important resource. Florida has a rich Cenozoic fossil record that is known mostly from studies of animal fossils. Plant fossils, however, have not received much attention. A few paleobotanical studies have dealt with leaf impressions (e.g., Berry, 1916; Lumbert, et al., 1984; Ivany et al, 1990) and dispersed pollen (e.g., Rich and Newsom, 1995). Some of the best preserved fossil plant remains found in Florida are fossil woods; however, to my knowledge, nothing has been published about them in the scientific literature. Petrified wood is sometimes found in the same strata as vertebrates and can be important in reconstructing the vegetation and probable climatic conditions inhabited by the extinct fauna. Fossil woods sometimes retain exquisite details of the original cell structure that can be investigated with the aid of a microscope. Such fossils may be identified by comparing their anatomy with that of modern woods or other fossil woods. This method of identification is similar to that used in the identification of timber woods in the forest products industry. Anatomical features such as presence of vessels, vessel size and grouping, distribution of parenchyma, ray size and distribution, are used in wood keys aiding in the determination to family, genus, and in some cases, species. In Florida, particularly well-preserved fossil woods have been found in the Bone Valley phosphate mining operations of Polk County south of Bartow, in the beds of the Suwannee and Santa Fe Rivers in Columbia and Gilchrist counties northwest of Gainesville, and in phosphate mining operations north of White Springs in Hamilton County. Undoubtedly, many other sites exist in the state that remain to be documented in the literature. Although petrified woods are relatively common at various sites in Florida, it is likely that many specimens are overlooked by those seeking other kinds of fossil remains. With this article I would like to remind fossil collectors of the potential scientific value of petrified woods and provide an introduction to the techniques of collecting, preparing and identifying them. Fossil woods can be preserved in a variety of ways. Sometimes the wood tissue is preserved in more-or-less original condition, remaining soft and unmineralized, and typically compressed by the weight of overlying sediment. This kind of fossil wood is common at some localities, such as the Pleistocene Leisey Shell Pit (Rich and Newsom, 1995). Woods preserved in this way are best stored in a 50/50 mixture of glycerine and ethyl alcohol to prevent fungal growth and/or drying and crumbling. 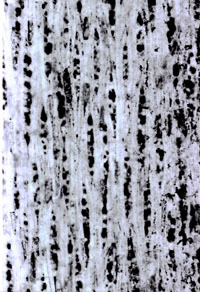 Such woods, if sufficiently soft, may be studied by sectioning with razor blades, or may be allowed to dry so that small fragments can be studied with the Scanning Electron microscope. In addition, techniques exist for embedding ancient wood or charcoal in epoxy resin to allow sectioning as if they were petrified (Smith and Gannon, 1973). When collecting such unmineralized fossil woods, one must be careful to avoid modern wood imposters, i.e., contaminants of recent origin. Petrified wood (wood turned to stone) falls into two categories: casts and permineralizations. The first step in formation of both of these types of fossils involves quick burial in sediment so that fungal and bacterial decay is retarded due to low oxygen levels. A cast is formed as minerals or other sediments fill and harden within the sedimentary cavity formed as the original wood deteriorates. Casts show the external form of the fossil but do not preserve internal cell structure, and consequently cannot be identified to genus or species. Permineralized woods are formed when minerals dissolved in ground waters infiltrate the wood, filling the spaces within and between cells, gradually embedding and preserving the entire tissue. Permineralized woods retain the original cellular structure and therefore can be identified by anatomical study. For purposes of identification, a small hand sample (measuring perhaps one to three inches on each side) is usually sufficient. It is not necessary and usually not desirable to collect an entire log, but it is advisable to collect pieces that are from the mature wood (outer portion of the stem or trunk). If a hand sample is being selected from a larger specimen in the field, it is best to select a piece that most clearly shows the grain of the wood. A 10X hand lens can be useful at this stage. Usually the darker colored portions maintain more detail than the lighter colored portions. As in all fossil collecting, the most important step is field documentation. The location of the specimen should be noted as accurately as possible. Photographs and/or diagrams of the specimens as found may also be useful. It is helpful to note whether the pieces collected are from a single log or stump, or whether several different sources were collected. It is also important to note whether the wood appears to have originated in place or whether it may have been relocated by slope movement, stream action, or human activities. If the wood is well preserved, it is usually possible to determine whether it is a conifer (softwood) or angiosperm (hardwood) by examining a freshly broken cross section with a hand lens. Conifer woods are composed mainly of narrow, elongate cells (tracheids) that function both in structural support and conductance of water. Conifers do not possess vessels (pores); thus, their wood has a smooth, even appearance. Angiosperm woods (including the dicots, or hardwoods) are composed of both vessels and fibers. The latter are narrow, elongate, thick-walled cells functioning in structural support. Vessels are water-conducting tubes that in cross section are distinguished from fibers and tracheids by their larger diameter and round or oval outline; each vessel is composed of moderately thick walled cells stacked end to end and connected by perforated end walls. Woods of temperate conifers and angiosperms typically show growth rings in cross section; i.e., the diameter of their tracheids and vessels is large in wood laid down in spring and then decreases to end in smaller-celled, thicker-walled summer wood, leading to concentric rings. In contrast, palm stems (belonging to the monocots) have a distinctive stem structure that lacks growth rings. 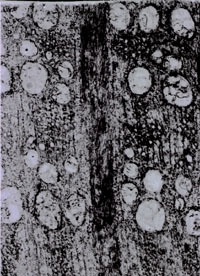 The “wood” of palm is composed of numerous fibrovascular bundles (small groups of vessels and associated cells) scattered in a matrix of unspecialized tissue, giving a speckled appearance to the cross section. Some woods, such as oak and palm, are so distinctive in their anatomy that it is possible to identify them simply with a 10x hand lens and without preparatory procedures. Usually, however, it is necessary to prepare thin sections so that the wood can be studied by transmitted light with a microscope at magnifications of 10 to 400 times. Modern wood sections may be prepared by boiling a small block of wood in water for some hours to soften and then slicing with a razor blade to make paper-thin shavings that permit observation with transmitted light. Because of their hardness, petrified woods must be sectioned with techniques suitable for cutting stone, which involve sawing, grinding and polishing. Although expensive equipment is available for preparing rock thin sections, it is possible with some practice to prepare quality thin sections using standard lapidary equipment that is commercially available for cutting and polishing rocks and gems. The methods for preparing thin sections with lapidary equipment are presented in the appendix. Identification of fossil woods is accomplished through comparison with modern woods and with other known fossil woods. There is a good literature on the anatomy of commercial timbers including keys for quick identification and descriptions and illustrations for thorough comparison (Gregory, 1980; Hoadley, 1990). Computerized keys are also available to help in determining modern and fossil woods (Wheeler et al., 1986). These works also provide an introduction to the terminology. Because of the three-dimensional nature of wood, it is usually necessary to examine both cross (transverse) and longitudinal (tangential and radial) sections for a complete study of the anatomy. Of the two kinds of longitudinal sections, the tangential section, which is cut through the wood along a plane approximately parallel to the bark, is particularly important for showing the structure of the rays. Rays are ribbons of tissue that run perpendicular to the grain and radiate outward from the central core of the tree. The radial section, which is cut in a plane along the radius of the stem, is helpful for showing the rays in lateral view and for showing pits and perforations of the vessels. The Paleobotanical Division of the Florida Museum of Natural History maintains collections of fossil leaves, woods, flowers, fruits and seeds of various geologic ages and from many regions of the world. Approximately 30 specimens of petrified woods from Florida reside in the collection, most of them having been contributed through the courtesy of private collectors. An analysis of these woods, and other samples that I have examined in private collections, indicates that the most common genera of petrified wood to be found in the Miocene and Pliocene of Florida are Pinus (pine) and Quercus (oak). The fossil woods that I examined are derived from three areas: Bone Valley, Santa Fe River and White Springs. The Neogene deposits of the Bone Valley region are well known for their vertebrate fauna (Morgan, 1994; Webb, 1990). These sediments range in age from Middle Miocene to Early Pliocene, and a careful study of the woods according to their stratigraphic position in this area has not been done. Numerous woods from the Mobil Big Four Mine collected and donated by D.B. Crissinger in 1992 were found to represent the pine family (Pinaceae; Figs. 1, 4). Three genera have been recognized in a suite of woods from the Cargil Mine collected and donated by Jim Toomey in 1995: Quercus, Juglans, and a conifer (probably Pinus or Taxodium although the preservation is not fine enough to be certain). The Juglans sample (Figs. 3, 6) is the only specimen of walnut wood that has been recovered so far from the fossil record of Florida. Its occurrence indicates that walnuts extended farther south into Florida in the Neogene than they do today. Although the black walnut (J. nigra) is widespread in eastern North America today, its modern distribution in Florida does not extend south of the Panhandle region (30š North latitude). Petrified woods have been collected from several underwater sites in the Santa Fe River bed bordering Columbia and Gilchrist Counties. The age of the sites vary, and there is a potential problem of mixing because the bed of the river carries woods from different Pliocene to Pleistocene horizons. Most specimens have been found to be Quercus. In addition, one specimen of an unidentified hardwood, and one of palm have been recovered. The Santa Fe 1B vertebrate fauna site (Morgan and Ridgway, 1987, pp. 15-16) of Late Pliocene (late Blancan) age, has yielded a single piece of palm (Figs. 7, 8) in addition to Quercus. A nice chunk of Quercus wood shown in the examples was collected by Eric Taylor and Eric Prokopi from the from the Occidental Chemical Suwannee River Mine, Hamilton County, is significant in being associated with late Miocene (middle Clarendonian) vertebrates (Morgan, 1989, 1994). The main genera of fossil wood so far found in Florida are briefly described below as an aid to collectors wishing to identify the woods in their collections. Woods with structure different from those discussed here are likely to be new records for the state of Florida. Transverse and tangential views of each wood type discussed here are shown at X20 magnification. Wood of the Pinaceae (pine family) has been found to be among the more common types found in the Bone Valley deposits. Pinus wood is very fine-grained, composed mainly of tracheids, and narrow rays (1-2 cells wide). In addition, it is distinguished by the presence of vertical and horizontal resin canals (Fig. 1). Taxodium (bald cypress) is another conifer that might be expected to be preserved as fossil wood in Florida. However, the wood of Taxodium is readily distinguished from that of Pinaceae by the lack of resin canals. Big Four Mine, Bone Valley, Polk County, Florida, X20 magnification. Figure 1. Pinus transverse section showing uniformly small tracheid cells and occasional circular resin canals. Figure 4. Pinus tangential section showing uniseriate rays. Same specimen as figure 1, X 25 magnification. Oak wood is ring-porous, with very large pores at the beginning of each growth ring that taper off in flame-like tracks to the outer part of each year’s growth (Fig. 2). The wood has two kinds of rays: narrow (one cell wide), and very broad (many cells wide)(Fig. 5). Such wide rays, in combination with the ring-porous pattern, make it easy to identify this genus with a hand lens. Figure 5. 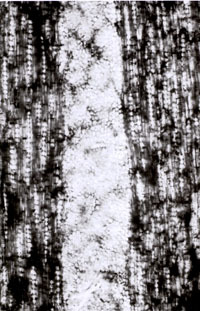 Quercus, tangential section with narrow uniseriate rays and a very broad multiseriate ray in the middle. Same specimen as figure 2, X 25 magnification. Figure 2. Quercus (oak) wood transverse section showing an extremely wide ray down the middle and large vessels at the beginning of each growth ring. Occidental Chemical Suwannee River Mine, Hamilton County, Florida, X20 magnification. 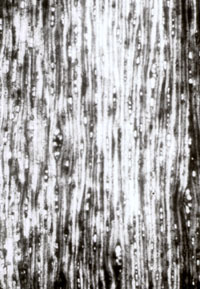 Walnut wood is diffuse-porous, with medium-sized vessels pores distributed evenly across the growth rings, and has wavy, thin bands of parenchyma (Fig. 3). The tangential section shows medium-sized rays (2-4 cells wide) rays (Fig. 6). A single sample of this genus is known from the Cargil Mine. Figure 6. 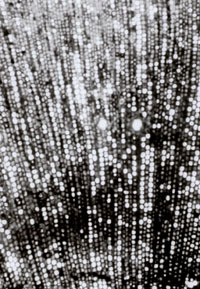 Juglans, tangential section showing medium-sized (2-4 seriate) rays. Same specimen as figure 3, X 25 magnification. Figure 3. 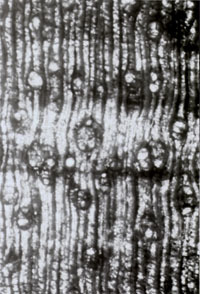 Juglans (walnut) wood, transverse section showing medium-sized vessels, thin wavy bands of parenchyma and medium-sized rays. Note the growth ring boundary oriented horizontally. Cargil Mine, Polk County Florida, X 20 magnification. Wood of the many genera of living palms is difficult to distinguish from one another, but it is easy to identify them to the family Palmae. Fossil woods of the palm family are generally assigned to the fossil genus Palmoxylon. A single small stem of palm was recovered from late Pliocene sediments in the Santa Fe River locality 1B (Figs. 7, 8). 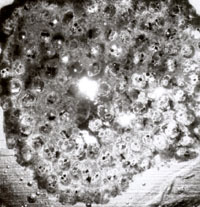 The stem shows numerous fibrovascular bundles in a ground mass of parenchyma cells. Figure 7. Palmoxylon, small stem of palm, transverse section showing numerous fibrovascular bundles. Late Pliocene (late Blancan), Santa Fe River locality 1B, Gilchrist County, Florida, X 15 magnification. Figure 8. 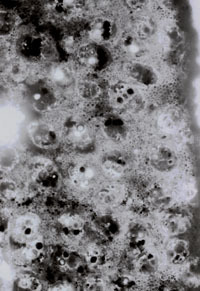 Same as figure 7, further enlarged, showing vessels within the vascular bundles and the ground mass of small parenchyma cells, X 30 magnification. Bartholomew, R.L., L.C. Matten, and E.F. Wheeler. 1970. Staining silicified woods. Journal of Paleontology, 44: 905-907. Berry, E.W. 1916. The physical conditions and age indicated by the flora of the Alum Bluff Formation, U.S. Geological Survey Professional Paper, 98:41-53. Hoadley, R.B. 1990. Identifying wood; accurate results with simple tools. Taunton Press, Newtown, CT 224 pp. Gregory, M. 1980. Wood identification: an annotated bibliography. International Association of Wood Anatomists Bulletin n.s. 1:3-41. Ivany, L.C., R.W. Portell, and D.S. Jones. 1990. Animal-plant relationships and paleobiogeography of an Eocene seagrass community from Florida. Palaios, 5: 244-248. Lumbert, S.H., C. den Hartog, R.C. Phillips, and S.F. Olsen. 1984. The occurrence of fossil seagrasses in the Avon Park Formation (late middle Eocene), Levy County, Florida (U.S.A.) Aquatic Botany, 20: 121-129. Morgan, G.S. 1989. Miocene vertebrate faunas from the Suwannee River Basin of North Florida and South Georgia. Pp. 26-55 in G.S. Morgan (ed. ), Miocene paleontology and stratigraphy of the Suwannee River Basin of North Florida and Georgia. Southeastern Geological Society Guidebook 30. Morgan,G.S. and R.B. Ridgway. 1987. Late Pliocene (late Blancan) Vertebrates from the St. Petersburg Times site, Pinellas Co., Florida, with a brief review of Florida Blancan faunas. Papers in Florida Paleontology, 1: 1-22. Rich, F.W., and L.A. Newsom. 1995. Preliminary palynological and macrobotanical report for the Leisey Shell Pits, Hillsborough County, Florida, Pp. 117-126 in Hulbert, R.C., Jr., G.S. Morgan, and S.D. Webb (eds. ), Paleontology and geology of the Leisey Shell Pits, Early Pleistocene of Florida. Bulletin of the Florida Museum of Natural History, 37: pp. 1-660. Smith, F.H. and B.L. Gannon. 1973. Sectioning of charcoals and dry ancient woods. American Antiquity, 38: 468-472. Webb, S.D. 1990. Historical Biogeography, Pp. 70-102 in R.L Myers and J.J. Ewel (eds. ), Ecosystems of Florida. University of Central Florida Press, Orlando. Wheeler, E.A., R.G. Pearson, C.A. LaPasha, T. Zack, and W. Hatley. 1986. Computer-aided wood identification. North Carolina Agricultural Research Service Bulletin, 474: 1-160. This article was a contribution to Papers In Florida Paleontology, No. 8, November 1996, published by the Florida Paleontological Society.